The Indians get off to a quick start in their 3-1 win over Thornton Academy. 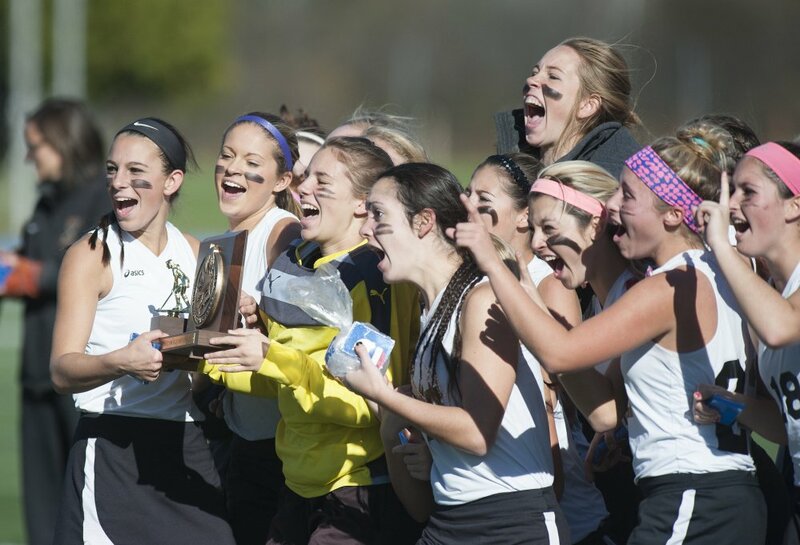 ORONO — There are high school sports dynasties … and then there is Skowhegan High field hockey. The Indians reclaimed the Class A field hockey state championship Saturday, defeating Thornton Academy 3-1 at the University of Maine. Skowhegan dominated the first 48 minutes, holding the Trojans without a shot, then held on for its 13th title in 15 years and its 16th overall. Skowhegan (16-2) lost last year’s title game to Scarborough with 2.1 seconds remaining. The Trojans (15-3) were playing in their first state final. Skowhegan took a 2-0 lead in the first half on two Brooke Michonski goals. She scored with 15:39 remaining when she controlled a long hit by Maliea Kelso behind the defense in the circle and beat goalie Isabella Capozzi, one-on-one. Then Michonski made it 2-0 with 2:11 left, carrying the ball down the right and scoring through a screen. But it was the defense that carried the play. The Indians used effective stick blocks to blunt many Thornton rushes, or simply cut passes off with great anticipation. And if a Thornton player got past a defender, there was usually another defender right behind. Thornton stayed close because of its defense, especially on penalty corners, where Ali Ouellette and Pickering continually broke up plays. Sweeper Grace Decker played a strong game and Capozzi made big saves. The Trojans finally got a shot, and it led to their goal. Libby Pomerleau broke down the left and was stopped by goalie Leah Kruse, but Taylor Ouellette was there to knock in the rebound – her fifth goal in the last three games – with 11:28 left. Lauren LeBlanc then scored with 6:46 left for the Indians.